Did you know that only 10-15% of what we perceive as “aging” is a result of the passage of time or genetics? Put another way: External factors are often to blame for a whopping 85-90% of facial aging. Aging caused by outside, environmental factors is what’s known as extrinsic aging. UV exposure, smoking, and pollution are examples of external circumstances that can wreak havoc on our skin. There are things we can do to prevent extrinsic aging, whereas intrinsic aging is inevitable; it’s just nature taking its course. Extrinsic aging is sometimes referred to as photo-aging, simply because UV exposure is the number one cause of it. There are several other culprits, however, and while most of them may seem obvious, there’s one that’s maybe less so. Research in recent years has shown that sugar damages collagen. I know, it’s a serious bummer. After around the age of 35, we become more susceptible to something called glycation. Glycation is when excess sugars in the bloodstream attach themselves to fats and proteins in the body. Collagen is the most abundant protein in the body. When sugars attach themselves to collagen and elastin fibers, they inflict damage; the fibers become stiff, inflexible, and weak. The bonds formed between sugar and protein are called AGEs (or advanced glycation end products). Over time the accumulation of AGEs causes an irreversible cross-linking of weakened adjoining collagen. This shows up on the face as a loss of elasticity, deep wrinkles, and thinner skin with more sagging. Pigmentation changes can occur, and the skin can become dry or rough. AGEs can cause acne or rosacea to worsen, and the skin becomes much more vulnerable to other external aggressors such as UV rays and cigarette smoke. Suddenly a cupcake just doesn’t sound as appetizing. Dr. Harold Lancer, the dermatologist to celebs like Beyoncé and Kim Kardashian, reminds us that sugar comes in many forms: “Processed foods that we don’t think of as sweet are typically loaded with extra sugars. It is important to read food labels and understand how foods are broken down…Complex carbohydrates, such as brown rice, vegetables, beans, and oatmeal are much better than simple carbs such as granulated sugar, anything with white flour, corn syrup, or fructose.” They’re better because food that rapidly converts to sugar (glucose) in your bloodstream can lead to glycation. If you’re committed to avoiding excessive glycation, you can check out where the food you’re eating falls on the glycemic index. https://www.gisymbol.com/about-glycemic-index/ Foods that score higher on the glycemic index digest rapidly, so they produce a more significant and more rapid rise (and fall) in blood glucose levels. This sudden spike in blood sugar is when glycation takes place. 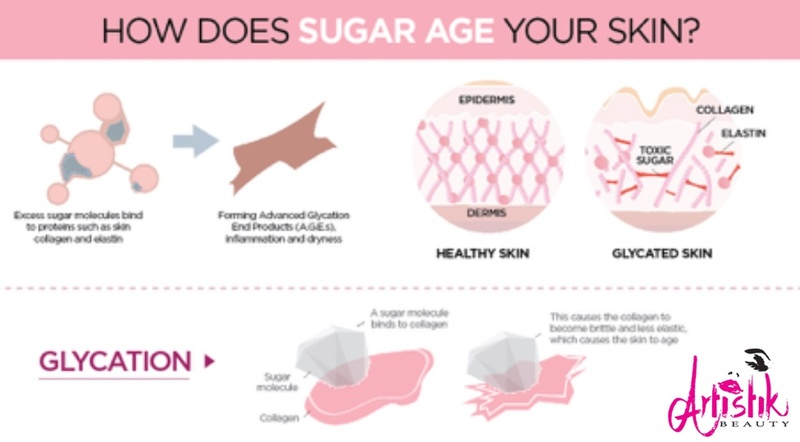 Of course, cutting out sugar isn’t just great for your skin! As a side benefit, you may drop some pounds or find that your overall health improves. Hey, if avoiding some extra wrinkles is what gets you motivated, then so be it! Dr. Lancer reveals that the reason most celebrities have chefs and nutritionists has little to do with their weight and almost everything to do with their skin and anti-aging. He says that because they must always look radiant and be seen on high definition television, they control their diets very carefully: no sugar, salt, alcohol, and minimal carbs. So, if you’ve ever wondered how certain starlets manage to look young for seemingly ever, consider that it could have as much to do with their diet as it does their access to expensive skincare, estheticians, and surgeons. Dr. Perricone recommends alpha lipoic acid for its anti-glycating effects. It can be taken as a supplement or applied topically. Other skincare actives that can potentially fight glycation are niacinamide and red algae. Experts also recommend taking B1 and B6 daily, as these have proven to be potent AGE inhibitors in several studies. Carnosine is a dipeptide (meaning it contains two amino acids) that helps reduce glycation. Let’s face it, removing every speck of sugar from our diets is nearly impossible. However, even moderately reducing our intake can go a long way towards slowing down the damage it’s doing to our skin (as well as our bodies). Dr. Lancer recommends that no more than 10% of our daily calorie intake be from sugar. It’s an addictive substance, so for many, it will be easier said than done. You may try weaning yourself off by eliminating one thing at a time. Concentrate on adding healthy foods too. A diet high in antioxidants has been proven to slow free radical damage and aging. Dr. Perricone recommends salmon, dark green vegetables, olive oil, and mixed berries for starters. In the meantime, don’t forget to apply a broad-spectrum sunscreen religiously and practice good skincare habits. Use a product with antioxidants during the day to combat free radicals and use a retinoid in the evening to encourage collagen production. Also, if you’re curious about what else was on Dr. Perricone’s list of “worst things we do to our skin,” after UV exposure and sugar/starch consumption, he cited cigarette smoking, insufficient sleep, and drinking alcohol. The more you know.